4: Goldie the Lionhead, Oliver the Black Moor, Clementine the Telescope-Eye, and Dazzle the Comet! + 16 fry. I don't think Goldie is feeling well ​Test Results for the Following:	* Ammonia Level(Tank) 0	* Nitrite Level(Tank) Unknown	* Nitrate level(Tank) Unknown	* Ammonia Level(Tap) 0	* Nitrite Level(Tap) Unknown * Nitrate level(Tap) Unknown * Ph Level, Tank (If possible, KH, GH and chloramines) 7.6	* Ph Level, Tap (If possible, KH, GH and chloramines) 7.6 (Maybe .1 lower? Colour is hard to read.) Other Required Info:	* Brand of test-kit used and whether strips or drops? API drops	* Water temperature? * Tank size (how many gals.) and how long has it been running? 75 gallons, set up three days ago	* What is the name and "size of the filter"(s)? Petco brand rated for 30 gallons	* How often do you change the water and how much? I have not changed the water yet, I was thinking I should do a w/c tomorrow..? * How many days ago was the last water change and how much did you change? No water change yet	* How many fish in the tank and their size? 4 goldfish: aprox. 1.5", 2x 3", 2"	* What kind of water additives or conditioners? API water conditionor	* What do you feed your fish and how often? 3x daily, food varies; Hikari Lionhead pellets, frozen bloodworms, frozen brine shrimp, spinach, peas, kale, lettuce. * Any new fish added to the tank? All fish are new to this tank, this is Goldie's first time being in a tank with one of the fish, the 1.5", Dazzle. * Any medications added to the tank? No	* List entire medication/treatment history for fish and tank. Please include salt, Prazi, PP, etc and the approximate time and duration of treatment. No medications have been used. * Any unusual findings on the fish such as "grains of salt," bloody streaks, frayed fins or fungus? A red cut/mark on belly	* Any unusual behavior like staying at the bottom, not eating, etc.? Frequentely stops swimming and floats head down-tail up for a few seconds. Swimming slower than usual. A few notes/explanations: I don't currently own nitrate/nitrite test kits. I will be buying them tomorrow or Friday. (Sorry!) I am aware the filter is not suitable. I plan to purchase a much larger one when I pick up the test kits. My guess is the red mark is from aggresive mating attempts since Goldie is confirmed female and Oliver, confirmed male, has been pushing her around lately. Any help is much appreciated! I'm curious why 1/2 inch or less sand is recommended? Is that not including heavily planted tanks since a lot of plants need deeper substrate for their roots? They're all adorable! You might have already mentioned this, but what tank are Tricycle and Fudgesicle going in after quarantine? I currently have 3 in a 20 gallon along with platys, guppies, and neon tetras. I started out with 4, but one passed away from unknown causes I have 4 new girls in quarantine right now that I will be adding into the tank in three weeks. The more females you have the more the aggression is spread out so no single fish will be picked on the most. I think 5 would be pushing it in a 10 gallon, shoot for a 20 gallon if you can. The key is LOTS of plants and hiding spots! You shouldn't be able to see clearly from one side of the tank to the other. Break up the line of sight. Most female livebearers bought at pet stores are already pregnant. My first guppy fry and my first platy fry were both from females that were already pregnant when I bought them! They do great together, but a word of warning: mollies and guppies will breed together! Say What?!? What do they make...Muppies No really they can mix? Yup, they're very closely related! It is the same for platy x swordtail. 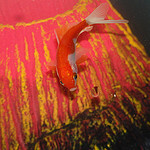 Here's a guppy molly cross: photo credit to yellowgirl on the tropicalfishkeeping.com forum Muppies or gollies? They do great together, but a word of warning: mollies and guppies will breed together! Are you a sucker for begging? Absolutely! But I never give more than they're supposed to have in an entire day, if I give in to their begging in between meal times their next meal will be smaller (I feed 3x daily). Love the photos! Keep em coming!! Picture heavy is great!!! AHH!!! The new tank is here!!!!!! I picked it up today and it's so amazing and I am so happy and excited!!!!!!!!!!!! It's a SeaClear acrylic, dimensions are 60"x18"x16" That would be a 75 gallon, but all the SeaClear 75g's I find online are taller and not as long. It's very strange... Perhaps an old retired model? I will have photos up within a couple hours!! It has scratches, but I guess that's to be expected from a used acrylic tank. Doesn't matter, I love it! The goldfish tag is a breeding ground for horror. I only look at #goldfishunion now. I decided to throw out the idea of a container pond and will be going with an in-ground preformed pond instead. I realized a stock tank just isn't the aesthetic I'm going for. I found one for cheap on CraigsList and will be giving the person a call after dinner! I think the hardest part will be digging the hole... I'm going to enlist the help of one of my strong friends.